The first minute of this free lesson is a quick preface about PrepCast features and functionality. Feel free to fast forward. "Project Integration Management. Project Integration Management includes the processes and activities to identify, define, combine, unify, and coordinate the various processes and project management activities within the Project Management Process Groups." This definition is taken from the Glossary of Project Management Institute, A Guide to the Project Management Body of Knowledge, (PMBOK® Guide) - Sixth Edition, Project Management Institute Inc., 2017. This lesson is an overview of the Project Integration Management Knowledge area. We look at why we have it, what we do and the concepts you must know for your PMP exam. In particular, we learn about the integrative nature of project management and the processes in this Knowledge Area. Please note that the transcript is provided for promotional purposes only. Transcripts are not provided for other PrepCast lessons. Hello, and welcome to this free lesson from The Project Management PrepCast™. I am Cornelius Fichtner and I am the lead instructor. Thank you for your interest in our Project Management Professional (PMP)® Exam training course. For over 45,000 students, The PM PrepCast™ was the right choice. This free session here will allow you to experience what the course is like and you’ll see that it is the right choice for you too. The greatest technological benefit that The PM PrepCast™ gives you over other online courses is the fact that it is a podcast that you can choose to download. This means that you cannot only watch online but even better. You can save all 150 lessons on your tablet or on your phone! In that way, your PMP® training course is always in your pocket no matter where you are even if you are offline. Preparing for your PMP® Exam has never been easier. Like I said, it’s the right choice! Please visit www.pm-prepcast.com for all the details. 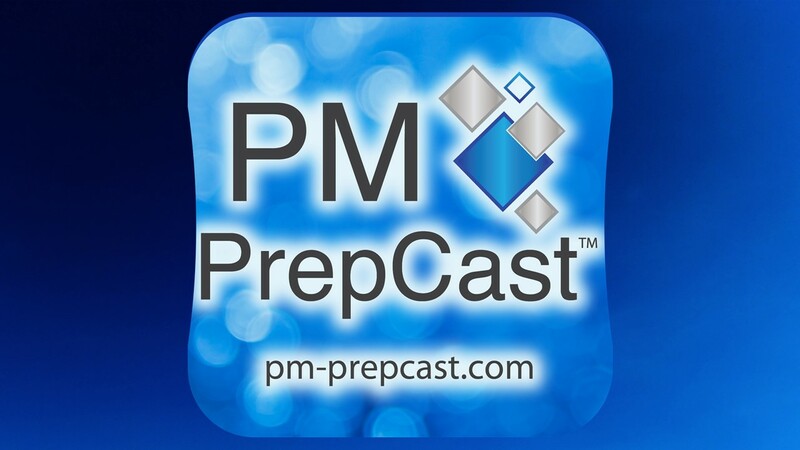 Hello and welcome to The Project Management PrepCast™, the exam preparation course you can download to your phone. I am instructor, Cornelius Fichtner. This lesson is an overview of the Project Integration Management knowledge area where we aim to accomplish a few things. First, we familiarize ourselves with the integrated nature of project management along with the roles and responsibilities of a project manager and the team. We then explore the different processes of Project Integration Management. We also examine key concepts where we look at why we have integration and then try to capture the main gist of what we do and what it is about. We look at trends and emerging practices, which the PMBOK® Guide describes as good practices that are starting to become more prominent and prevalent on current projects. We cover tailoring considerations for integration management that a project manager should think about when adapting the project. To fulfill the particular needs of project stakeholders, organizations and the environment. And lastly, we have Agile and adaptive perspectives to reflect upon and apply to Agile and adaptive project environments and development life cycles where change is prevalent and where teams handle work incrementally. These life cycles especially Agile have many of the aspects of integration built in. Project Integration Management is the first knowledge area in the PMBOK® Guide so this is most likely the first knowledge area overview lesson that you are watching. Let me just say, most of them are divided into the same two parts. In Part 1, we provide an overview of the integration management knowledge area and its processes and start by describing some of the key concepts. And then in Part 2, we continue to look at key concepts and then proceed to discuss trends and emerging practices tailoring considerations, as well as Agile and adaptive perspectives that are described in the PMBOK® Guide. And if you would like to following with this lesson then please open your PMBOK® Guide and turn to pages 69 to 74 which is the core material, and then also on page 673 which summarizes the key concepts. We begin with the definition of this knowledge area. Project Integration Management includes the processes and activities to identify, define, combine, unify and coordinate the various processes and project management activities within the project management process groups. What does this mean? In the PMBOK® Guide, you find over 45 processes telling you how to execute various aspects of your project, for instance, how to create a risk management plan or how to control your schedule. The processes sometimes seem rather scattered and unconnected. Yet somehow, you as the project manager must combine, unify and coordinate them. You have to bring them altogether much as a conductor does standing in front of the orchestra coordinating the musicians. Integration management helps you to do all these things. Understanding integration management is not rocket science. On a conceptual level, the processes are easily understood and the PMBOK® Guide describes individual process relations to each other and the project. However from a practical point of view, it is actually much more difficult to execute them during a project. You not only need to learn the mechanics of project management that are explained in the various processes but you must also learn and master the art of project management. Speaking of art, we need to paint a picture before outlining the processes in this knowledge area and this is different than other overview lessons that you will see going forward. Other knowledge area over your lessons, they go directly to talking about the specific processes under the knowledge area at this point of the lesson. But since Project Integration Management is so central to our learning, we first want to paint the scene by discussing some key aspects of integration and why you need to pay attention to managing it on your project. First and foremost, it is important to understand that on every project, integration is considered a central activity. Another way to describe it would be essential and vital since integration is how the whole project comes together. Therefore when you go through each process, you should understand the inputs, tools and techniques, and outputs for each process. Sometimes these are referred to as ITTO’s. And not simply memorize them. For your exam, you should understand why we use a process and its purpose. As the project manager, you consolidate and integrate the many project management actions that are necessary for your project to succeed. What do we mean by that? Well you manage stakeholder expectations such that you may have to include and incorporate new needs into the project. For example when a new requirement, risk or stakeholder comes along, you may need to accommodate, combine and adjust things on the project. Another aspect involves integrating the project into existing operations. The product, service or results that the project delivers must be incorporated into the ongoing operations of your organization. With all those points in mind, we are now going to take a moment to consider a few more aspects of integration. Four of the processes in this knowledge area, we’ll describe these in more detail later on. Begin at the very start of the project and end with its closing. They are Direct and Management Project Work, Manage Project Knowledge, Monitor and Control Project Work, as well as Perform Integrated Change Control. They are ongoing processes where we make sure that the project moves through all the stages from initiation to closure. The project manager and the project management team have to make decisions on a day-to-day basis to execute the project in a way that ultimately delivers the agreed-to result. Another good rule of thumb is that we as the project managers simply cannot take shortcuts in coordinating these processes. The project manager must perform all of the processes and cannot remove or skip a project management process here or there just because it looks like they are not necessary. For example, it may be prevalent or a strong desire in your company that a project builds a product in-house and does not use vendors. However, this doesn’t mean that you can simply forego and cut out Project Procurement Management. You should at least perform your due diligence and go through the plan procurement management process in Project Procurement Management in the knowledge area. You need to do that properly in order to come to an appropriate make-or-buy decision. This means that the idea is that the project management team tailors the processes and decides how much and to what depth each is used. In this example here after the team goes through the make-versus-buy analysis and decision then the team can decide how much or how little of the remaining procurement processes are really required on the project. You can’t just cut them out without looking at them. Here’s a question for you: When it comes to roles and responsibilities in integration management, who do you think is responsible? Well although the team may have some role to play especially in fast-changing project environments, it is good for team members to contribute and play their part. However, this here, integration, is so critical and integral to the project that the project manager is responsible with help from the project team for the processes and ultimately accountable for the processes being completed correctly. The accountability cannot be delegated or transferred. Integration is the job of you, the project manager. The project manager may have members of the team who manage other knowledge areas such as schedule, cost, risk, procurement, and so on but it is important for the project manager to oversee all these knowledge areas in integration. There is another important note about project processes and their interactions. If you look at the PMBOK® Guide, you may be under the impression that project management is a neat and orderly thing. However, anyone with minimal project experience knows project management is not as clear-cut. In real life, processes interact with each other in many more ways than is shown in the PMBOK® Guide. In the Guide, it looks like we have a nice jigsaw puzzle. But in real life, each project is like a town with buildings, roads, vehicles, people, shops and cinemas where all of them interact with each other in countless and sometimes unpredictable ways. The PMBOK® Guide tries to make you aware of this. You can get a feel for the buildings, roads and vehicles by looking at the data flow diagram in the PMBOK® Guide. There’s one for each process that shows how the processes interact with each other. This example here is of a data flow diagram for the Develop Project Management Plan process in integration. However, you must understand that the data flow diagrams do not depict all process interactions and data flow among the processes in detail. The processes may be presented here as unique and separate processes with defined interphases while in practice they intersect and interact in many more ways. The number of iterations through a process and interactions among other processes vary from project to project. Remember, the PMBOK® Guide is just a guide. It does not claim to contain every bit of project management know-how. It is though what you need to know to pass your exam. After this review of the key aspects, we will proceed to look more closely at the seven processes that make up Project Integration Management. In the individual lessons of the appropriate process, we will discuss each of them in detail. Right now our goal is to provide you with a high-level understanding. The first process is Develop Project Charter. This is the process of developing a document that formally authorizes the existence of a project and provides the project manager with the authority to apply organizational resources to project activities. The second process is Develop Project Management Plan. That’s the process of defining, preparing and coordinating all plan components and consolidating them into an integrated project management plan. That’s followed by the Direct and Manage Project Work process, the process of leading and performing the work defined in the project management plan and implementing approved changes to achieve the project’s objectives. The next process is Manage Project Knowledge. That’s the process of using existing knowledge and creating new knowledge to achieve the project’s objectives and contribute to organizational learning. The fifth process is Monitor and Control Project Work, the process of tracking, reviewing and reporting overall progress to meet the performance objectives defined by the project management plan. Then we have Perform Integrated Change Control. This is the process of reviewing all change requests, approving changes and managing changes to deliverables, organizational process assets, project documents and the project management plan and communicating the decision. And then finally, we have Close Project of Phase. Its purpose is to finalize all activities for the project, phase or contract. And here is how the seven processes from this knowledge area mapped to the various process groups: Develop Project Charter is part of the Initiating process group. Develop Project Management Plan is in planning. Well no real surprise here. The plan is in planning, well that makes sense. Next we have Direct and Management Project Work, as well Manage Project Knowledge. Both processes are part of Executing. They are in this process group because for once, you are not just doing project management work but you are actually doing some real work on the project deliverables. It should also come as no shock that both Monitor and Control Project Work, as well as Perform Integrated Change Control are part of the Monitoring and Controlling process group. And lastly as you would expect, Close Project or Phase is part of the Closing process group. And here is one last piece of trivia: Close Project or Phase is the only closing process anywhere in the PMBOK® Guide. No other process falls under closing. You can see that Project Integration Management is unique. It has seven processes, at least one is found in each of the five process groups that makes integration management the only knowledge area that has one process in each of the five process groups. Think of these seven processes as the lead chair in the sections in the orchestra, each playing their parts at just the right time as conducted by you, the conductor, the project manager. For instance, the second process in integration is Develop Project Management Plan. This particular process is leading the planning process section of the orchestra. Moreover, the responsibility of the process is to ensure that all the other 23 processes in our analogy, all the woodwinds in this planning process group are properly coordinated and executed. Also what you see here is probably the most colorful slide that we have anywhere in the PrepCast. It looks like we have managed to squeeze every single color that we use for highlighting onto one single screen. Whew! Let’s move on. The first process in Project Integration Management is Develop Project Charter. The project charter is often the first document on a project. The charter is a document that formally authorizes a project. It presents the project manager to authority to apply organizational resources to the project. In other words, the project manager is named in the charter. This could be you and it confirms that you are now allowed to spend resources. It authorizes you to spend time and money, and even higher people for the team. Also important to know is the fact that the project manager should be assigned prior to the start of planning and preferably as you are creating this charter. The Project Charter is a very important project document and you must understand its purpose for the exam. That’s why we have a separate lesson just on the Project Charter where we look at the details. After developing the charter, which is part of Project Initiation, is the big planning process group. Planning tells us what we have to do and sets the expectations of our stakeholders. What is the goal of all these planning? Well from a project point of view, the goal is to define what we need to deliver and how we are going to deliver it. What we deliver is primarily defined in the product scope but also in the budget where we say how much it costs in the schedule where we provide the timeline for delivery and in the quality management plan where we define degree of adherence to the specifications and the requirements where we describe the grade of the product. The how is the defined in all our various other plans, which create the project scope. For instance, the resource management plan describes the processes to follow, to assemble a team of specialists who can deliver the project. This plan could say that our preference is assigning internal resources and only after we have exhausted those resources should we look at hiring external consultants. It also says that we need to employ three new engineers for project-specific research and design. After completing the processes in the Planning process group, we should have a solid understanding of our project and product. Thanks to all the plans that were developed and integrated into the project management plan. So defining the ‘what’ and ‘how’ is done during planning and the output of all the planning is the project management plan. We have a separate lesson on just the project management plan but for now let me just say that in some processes, the project management plan is a newly created output. Other knowledge area processes may be updating the existing plan or adding a new subsidiary plan. The Project Management Plan is not a single document. Instead it is a collage of integrated subsidiary plans like the Resource Management Plan and the Quality Management Plan, as well as other important documents for the project. In addition, it is probably the single most important document on the project and that makes it extremely important for your exam. Another important cornerstone of integration is learning from historical files. Why you may ask are we emphasizing old files? Well historical files are part of the Organizational Process Assets. Embedded in this are the files on lessons learned aptly part of the lessons learned register. The idea is that we integrate the lessons learned from previous projects into the activities that we perform on the current project leveraging the successes and failures of prior projects. It is a project management best practice to hold lessons learned meetings so that you can enable improvements of your own and future projects and to document these lessons by creating and maintaining a lessons learned register on your project. These lessons and other historical files serve as an essential and helpful reference to understand how others have succeeded or struggled. Important outputs of the Close Project or Phase process are organizational process asset updates, which in future become part of the organization’s historical facts. Therefore, the cycle continues. Your own project experience serves as historical files and lessons from which other projects, future projects and other project managers can benefit. Managing knowledge is part of Project Integration Management. Knowledge Management, however, covers more than just the lessons learned and historical files that we just discussed. How the project acquires or creates the knowledge, how it transfers and how it uses this is vital. Knowledge is the foundation upon which you the project manager and your team stand as you go step by step through the project. To reduce chaos on a project, the PMBOK® Guide defines the requisites of an integrated change control system. It helps manage change to the project and product scope. The system whether it is manual or integrated computer system is called the Change Control System, which is a set of procedures that describes how modifications to the project deliverables and documentation are managed and controlled. For example, if you want to add another bathroom to a house, you have to invoke this change control system in order to make the appropriate updates to the current configuration of your house. A major part of this system is the Configuration Management System, which is a collection of procedures used to track project artifacts and monitor and control changes to these artifacts. Items that are listed in the configuration management plan are tracked in the Configuration Management System and are referred to as under configuration control. For instance, if you build a house, the plans and drawings are probably under configuration control because they describe exactly what to build. They show how your house is laid out and configured. Both of these are parts of an integrated change control system. This is one of the major systems on a project because it controls change, which reduces the number of unplanned changes. One does not want chaos on the project where everyone and anyone can add or remove scope where nobody keeps track of who does what and why. At its core, a change control system is very simple. If you want to make a change, fill out a form referred to as a change request. This form is to be reviewed more closely by subject matter experts who make a decision as the changes merits. If it is approved, we integrate it into the project. If it is denied, we give the originator a reason for denying it and that’s it in very basic terms. Change requests, they should be in writing. Verbal change requests are too error prone. You can get this change request from internal sources like your stakeholders or from external sources such as government agencies or new laws. Some change requests like those resulting from government regulations are mandatory. Nevertheless, they must go through the integrated change control systems where their effect on the rest of the project is evaluated. Finally after all the work on the project is complete, we have the Close Project or Phase process. This process is performed once at the end of every project, phase, procurement agreement and the completed project. Expert judgment is needed during this process to make sure that nothing gets forgotten and that the project or phase is closed according to all the relevant standards and procedures that we should be following. We make our final updates and transition any deliverables onto the appropriate parties who could be inside or external to our organization. Closing the project concludes our integration responsibilities, as well as other project manager duties. We lock the door to the project and pass on the keys. So what should you remember to take away from this first part of the lesson? At a basic level, you should know what processes make up Project Integration Management. It’s not just about memorizing the list of names of the processes in the knowledge area but understanding various concepts and the purpose and activities of each of the processes. And as a general rule, exam questions on integration management tend to focus on the integrative nature of the processes. You should understand that you must follow the appropriate procedures such as performed integrated change control process to complete the project successfully. And this concludes the first part of this Project Integration Management overview lesson.